In Edmonton exterior house cleaning services from Shack Shine are just a phone call away. 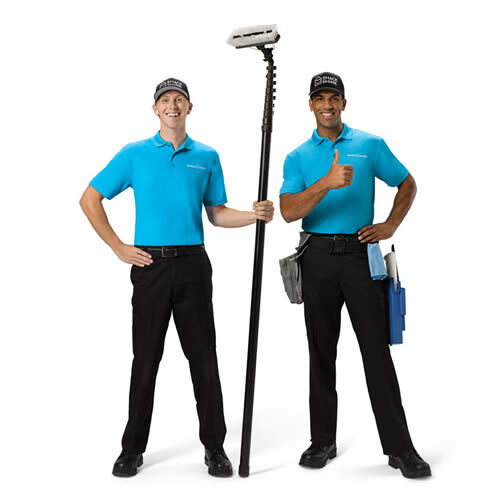 If you are ready to have a home that’s positively shiny, contact our smiling, friendly technicians. We’ll arrive in shiny, organised trucks to provide a complete exterior cleaning of your home in one detailed visit. We know our customers are busy people with a long list of things to do. But, you also care about your home. That’s why it is important to use our world-class customer service at Shack Shine. You can book the exterior house cleaning services you need in a flash and right online. We’ll arrive and clean your home just the way you like it. Shining home, smiling family. Exterior window cleaning is one of the services we offer. Our team uses a specialised squeegee tool to scrub the windows for you. This is attached to a carbon fibre, water-fed pole that helps us to clean the windows expertly from the ground. No ladders needed! We wipe down the frames and screens, too. You don’t even have to be home – just make sure you close the windows before you leave. Happy home, happy family. The eavestroughs on your home must be debris-free to keep water moving away from the home, but that’s a hard, dirty job that most homeowners don’t have time to manage. With our high-powered vacuum, we will remove all of the debris there before flushing it clean. You can trust our home detailer to provide you with easy-flowing eavestroughs that protect your home’s roof and foundation. Do you want to have a like-new home? Perhaps the brick or siding is dirty or caked with debris. No problem! Our Shack Shine exterior house cleaning services in Edmonton can help. We use just the right amount of pressure along with environmentally friendly cleaning agents to strip it all away for good. Your home will look brand new and this may even extend the life of your siding. The roof is another area of the home that benefits from power washing. Shack Shine’s team is shining your neighbourhood, one home at a time – starting right from the top. We’ll wash away all of the debris, mildew, moss, and other surface items to create a like-new look. Our methods are very safe and will not damage the roof itself. However, this is an important way to protect your home’s roof. Many of the exterior surfaces outside of your home can benefit from our pressure washing. In Edmonton, exterior house cleaning services from Shack Shine can include power washing concrete, decking, driveways, and much more. Let’s talk about how to remove years of debris and grime build-up from your home’s exterior. We’re making your home smile through each one of these projects we tackle for you. Are you getting your home ready for holiday gatherings? Shack Shine is ready to help you install Christmas lights—ensuring your house shines brightly to greet guests. We offer lights in a variety of colors and shapes. Everything is customizable, which means we measure and cut the lights to fit your unique roofline and windows. At the end of the season, we will return and take down and pack away the lights neatly for easy installation next year. 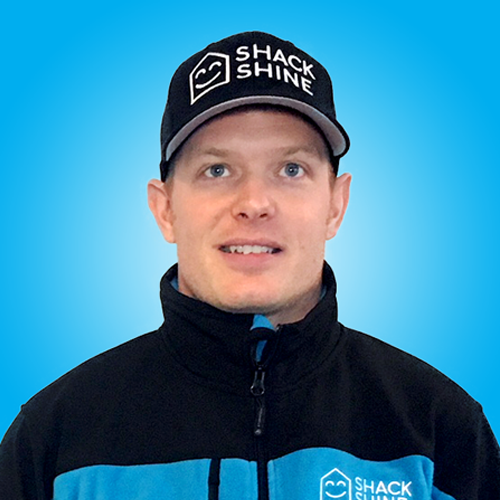 My name is Dustin Grainger and I am the owner of Shack Shine Edmonton. I was born and raised in Saskatchewan but have been in Alberta for the last 10 years. I am a proud SAIT (Nuclear Medicine ’07) and NAIT (Instrumentation Engineering Technology ’15) alumni. My career in Nuclear medicine has enabled me to gain a great understanding of how to create great personal relationships along with a purpose to serve others. I have always had the entrepreneurial bug and it was through my experience with Instrumentation and a start-up company that I have gained the necessary hands-on skills and developed invaluable core fundamental business insight. I jumped at the opportunity of being involved with Shack Shine because I firmly believe in its vision and core values: Passion, Integrity, Professionalism, and Empathy. House detailing is a fragmented industry with no clear leader and Shack Shine has the required leadership and systems to become the chosen brand in this market. I truly believe in its vision and culture of “People First”. I love the city of Edmonton and the proximity to the mountains. With skiing, snowboarding, golfing a favourite hobby away from work, it enables me to enjoy the benefits of being in the great province of Alberta. I can’t wait to service Edmonton and surrounding areas and really put a smile on customer’s faces when they see the incredible work we do and the attention to detail and service we provide!